October in a Tweet: the festival hits arrive in cinemas alongside numerous Halloween animations and Bond proves he is still nifty at fifty. Happy Birthday 007! Everyone was talking about... Disney purchasing Lucasfilm and announcing Episode VII for 2015! A game-changing bombshell dropped at the end of the month. Best Film: The Perks of Being a Wallflower - a sweet, perfectly-acted, feel-good, coming-of-age drama. Lost in Translation for teenagers. Best Actor: Javier Bardem as the literally jaw-dropping villain, Raoul Silva, in Skyfall. Best Director: novelist Stephen Chbosky makes a strong directorial debut with Wallflower, adapting his own novel and crafting a beautiful-looking film. Best Twist: M (Judi Dench) dying in Bond's arms in Skyfall. A bold move but understandable and a necessary kick for the fifty-year old franchise. Best Scene: the tunnel scene from Wallflower to the tune of David Bowie's Heroes. Wonderful. Other Best Scene: Silva's rat monologue as he strolls towards the camera. A spectacular entrance. Worst Scene: CGI komodo dragons dragging off henchmen in Skyfall. There goes the gritty, realistic Bond era. Best Line: "I'll hazard I can do more damage on my laptop sitting in my pyjamas before my first cup of Earl Grey than you can do in a year in the field." 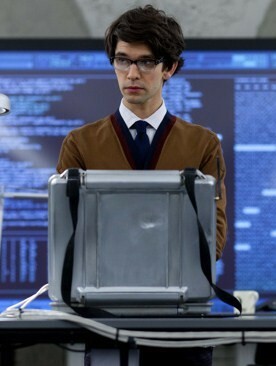 - Q (Ben Whishaw) arrives with some snappy dialogue. Missed Opportunity: killing Javier Bardem's Raoul Silva was a waste. Bond needs a new Blofeld and Silva was the best Bond villain in years. A shame he won't be returning. RIP: Harris Savides, the award-winning cinematographer, died of brain cancer. Savides had worked with Gus Van Sant, David Fincher, Sofia Coppola, Woody Allen and Ridley Scott during his long career. Notable films include Elephant, Milk, Zodiac and American Gangster. Films Seen: The Perks of Being a Wallflower, Skyfall.